Erev Sukkot occurs less than a month away, on October 16. There is nothing quite so magical and tranquil as easing off the Yamim Nora'im, the Days of Awe, sitting in a beautifully decorated sukkah and seeing the stars through the patchy thatchy "roof." It's a time to decorate with fruits and vegetables, especially the Shivat Minim, the Seven Fruits of Israel: wheat, barley, grape, fig, pomegranate, olive and date palm. It's also a time to invite our ancestors to join us. 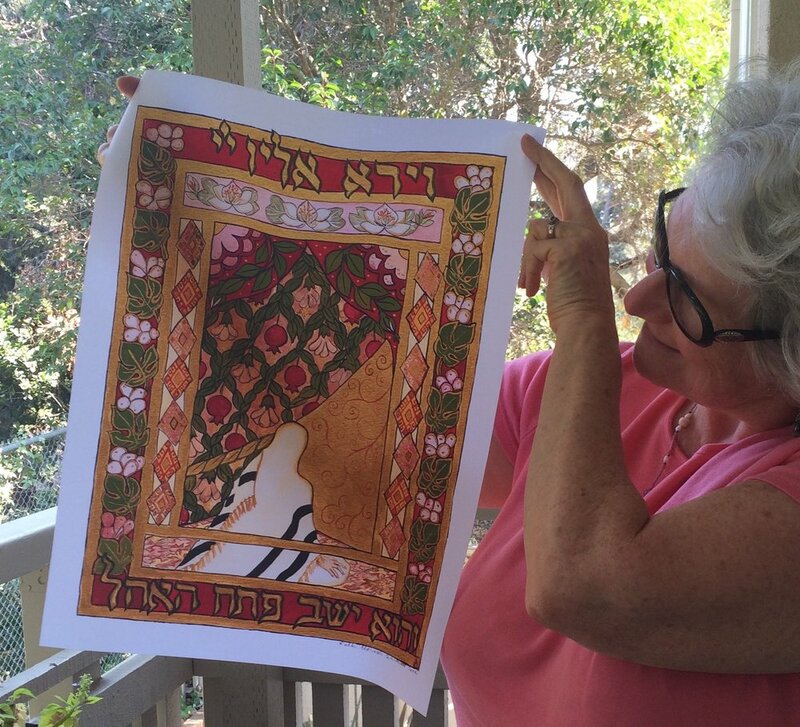 So I am incredibly pleased to let you know that I now am able to offer you designs printed on water resistant fabric to decorate your sukkah! In fact, you can get ANY IMAGE printed on fabric that is listed under the "ArtPrints" button on the HOME PAGE. The colors are bright and beautiful, the print precise and articulate. These will make a really memorable sukkah for your home or community. Check the "Fabric Option" under the variant: size/gold embellishment/fabric. ORDER BY OCT. 6 TO GET YOUR SHIPMENT BY EREV SUKKOT. The water proof fabric banners are $125 each.